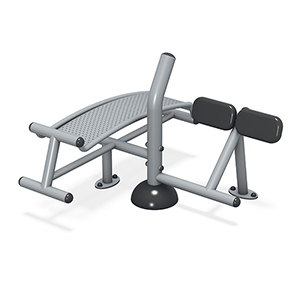 Provide a convenient place to strengthen core muscles by oneself or with a partner by installing this combination Sit-Up Back Extension Station. Great as a stand-alone station stop along a fitness trail or cluster with other fitness elements for well-rounded workout destination. Tailor made for comfort, the back extension apparatus is equipped with cushy weather-resistant thigh padding and perforations in the sit-up bench supply ample air flow. The station is built for staying power with durable powder-coated steel components, engineered for safety and performance. The body's core is made up of a series of complex muscles that is active in every movement and supports our spine, back, shoulders resulting is better posture and balance. Performing a variety of ab exercises helps create an overall stronger core boosting health, self-esteem and confidence.